I like to think that my family is doing its part to save the planet. My husband and I both drive fully electric cars, I bring my own bags to the grocery store, I make my own laundry detergent, and we recycle. We also support the idea of harnessing solar energy and someday hope to have solar panels on our home. Awhile back, I saw this Instagram photo that Carla from Granny Maud's Girl posted. I can't tell you why but I absolutely fell in love with those cute little snaps. 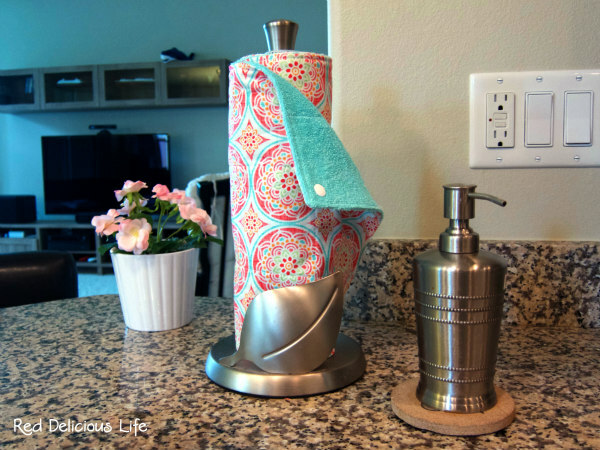 Within 24 hours I had ordered my very own KAMSnap tool that came with some basic white snaps (not an affiliate link) and I knew exactly what I wanted my first project to be -- Unpaper Towels. When my husband first saw these on our kitchen counter his first words were "What the #$@% are these?!" I had to laugh at this. I don't think he's going to be a big adopter of this eco-friendly paper towel alternative, and I'm okay with that. I'm not planning on getting rid of conventional paper towels - it's just not practical in our household, especially with a six-year-old boy and 3 cats (one of which likes to binge and purge). But if we can reduce our overall landfill waste, I'll consider it a win. And I honestly don't think they're going to add anything to our current laundry so that's another plus. 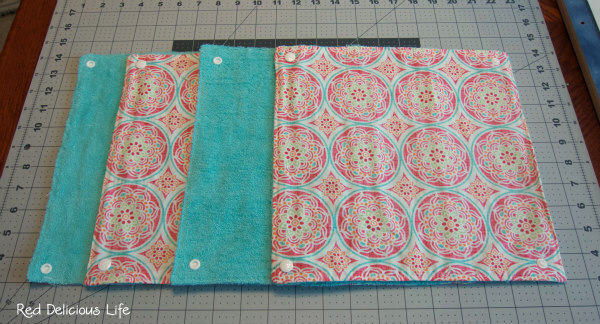 This was a very quick project consisting of cutting terry cloth and cotton both to 12 inches square, sewing them with right sides together, turning them right side out, and topstitching all the way around to close the opening. I also quilted a basic 9-patch grid to keep the layers from shifting during use. The fun part was getting to put the snaps on them. Snaps are put on all 4 corners - 2 male connectors on one side & 2 female connectors on the other side. The final part of this project was figuring out a good way to keep them rolled up on my holder. I went to the local craft store and picked up some heavy duty needlepoint plastic. 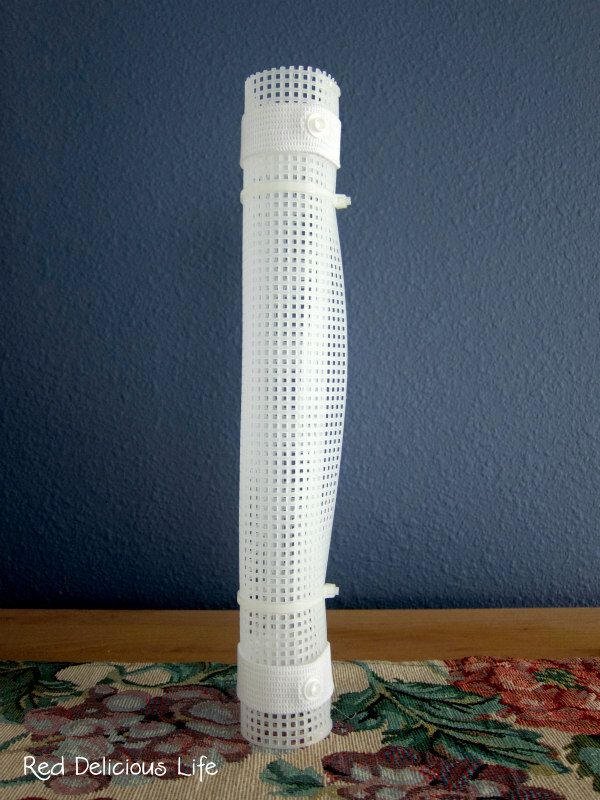 I cut off a length of it and used some zip ties to make it into a tube. My original idea was to add the snaps directly to the plastic but it proved to be too thick and wouldn't work. Enter Plan B - attaching the snaps onto elastic loops. Success! The great thing about these is that I can change them out to coordinate with the different seasons if I wanted to. Here is the second batch that I've already made, including some that are half-size to see how I like them. I can think of so many great uses for these little snaps - especially an alternative to zippers on things like pouches and pillow covers. Can't wait for the next snap project. Hmmm...I never considered unpaper towels...interesting. We try to be environmentally friendly (compost, cloth grocery bags, etc), but I know we could do a lot better. These are a great idea Diana. We are in the mindless habit of yanking off a paper towel for just about anything and just to the left of that cabinet (where the paper towels are) is a drawer of cloth rags that would work just as well. Great post! I've never used paper towels. I grew up with rags and I use rags. However your idea is much more stylish. They look great in your paper towel holder. I hope this catches on Diana. Those are awesome, love it! 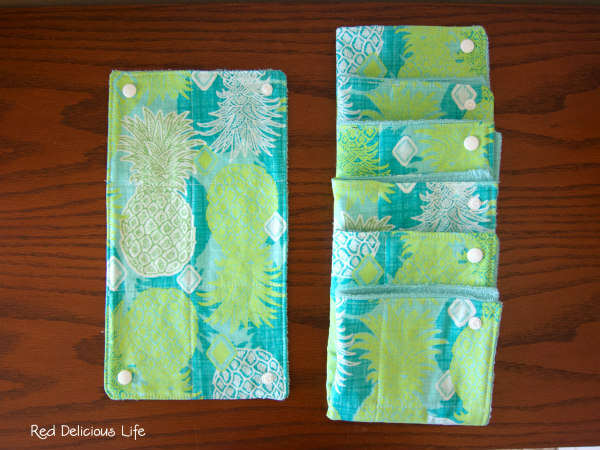 I am totally going to do this - I do feel rather guilty abut the amount of paper towels we use, this is an awesome alternative..thanks so much for sharing it! What a fabulous idea! The towels are so pretty and a great alternative to disposable. Bravo for a great use of the new snaps! The snaps are super cute. Although let me know in a month if they are practical. It seems like they would become another chore. Also how many could you fit on your roll? I don't add the snaps. I just fold them in half and place a stack on the counter top pretty side out. These are a great idea! I can see these really cutting down on the amount of paper towels used. Yay! A snazzy new use for snaps! These are far fancier than my cleaning cloths. Years ago, I used an overlocker (serger) to cut and hem old and worn towels into useable squares and rectangles. I trimmed off any holes as I went. They are not fancy (even when I threaded my overlocker with red thread and sewed on white towels), but they work a treat. Many of those cleaning cloths are STILL being used. These are fantastic! Your color choices are perfect <3 but the whole idea of it is wonderful! If you don't mind, I'm going to save them and make (for myself! &) as a thank you gift for next year! Thanks so much for the great post!